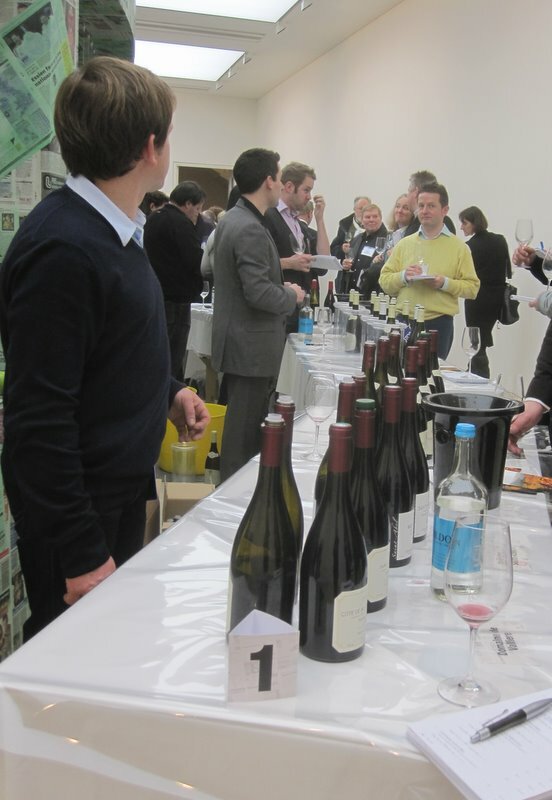 And now, my entry into the most overdue blogpost of the year competition, it being not far off a month since I skipped down to the Saatchi Gallery to Bibendum’s annual trade-and-assorted-hangers-on tasting. Just as well that, as the small object in the foreground of the picture above proves, I had a notepad (well, they gave it to me when I got there) and a pen, and made good use of both as I went around. I needed something to aid my memory, the sheer scale of the event (not that big, I’m sure, if you’re used to these things, but I’m not) otherwise capable of leaving me bewildered, senseless. Every room was full of people, bottles, glasses, overflowing spittoons. I had a couple of hours. Where to start? What to do? Drink geographically? Thematically? Give up and go home? Take up smoking again? My answer, in the end: walk around the entire building, and then drink whatever looks interesting, and that I don’t tend to drink much at home. I started with Rieslings. I tried Kiwis. I tried Australians. I tried Germans. Knappstein won, with their Ackland Vineyard Riesling 2008 – it was crisp, dry, refreshing, tart and tingly. Loser was Dr Loosen’s Wehlener Riesling Kabinett 2007, which lacked the thrilling sherbet zing and replaced it with depressing, puckering sweetness. I’ve read a lot more that I’ve experienced about kabinetts, and won’t be rushing back. The best thing about Dr Loosen is that he was next to Chapel Down, the English producer whose Pinot Blanc 2006 ripped up all my pre and indeed postconceptions about English wine – delicious. Then, after a spot of lunch, I let rip on the pinot noirs. Kiwis, Aussies, Burgundies, whatever I found, I sipped. And this was won by a Marmesa 2007 from California, which I happened upon while I was supposedly taking a short breather in Tim Hanni’s taste test corner. I have no idea how this grape manages to make either really quite full-bodied wines or really very light-bodied ones, but I like the heavy ones. And then a bit of freestyling. Some delicious chablis. Some way too young, vicious and aggressive 2007 C9DP (as I believe it’s called by the pros). And then, with time running out, I hotfooted it over to the cognac corner and had myself a half-hour chat with the brilliantly named Bernard Boisson (destined from birth to enter the drinks industry, you’d have thought) of Edmond Audry Cognacs, sipping my way through a selection of his wares culminating in the £128.17 (trade price) Audrey Exception. Awesome. And a great character. Wine’s not just about the drink, it’s about the people, the place, the experience. I’m immensely grateful to Bibendum’s generosity for letting me in, getting nothing in return except a criminally overdue blogpost on a blog nobody very much even reads. If they’re foolish enough to be so munificent next year, I’ll be back. This entry was posted in Uncategorized and tagged Bibendum, Bibendum Times, Dr Loosen, Edmond Audry, Knappstein, Petaluma, Saatchi Gallery. Bookmark the permalink.